The Alpha Particle X-Ray Spectrometer on the Mars Exploration Rovers, Spirit and Opportunity, is also called the APXS. The APXS reveals the elemental chemistry of rocks and soils by measuring the distinctive way difference materials respond to two kinds of radiation: X-rays and alpha particles. MAIN JOB:To determine the elements that make up rocks and soils, providing information about crustal formation, weathering processes and water activity on Mars. DATA ACQUISITION:Most APXS measurements are taken at night and require at least 10 hours of accumulation time. The APXS determines the elemental chemistry of rocks and soils using alpha particles and X-rays. Alpha particles are emitted during radioactive decay and X-rays are a type of electromagnetic radiation, like light and microwaves. 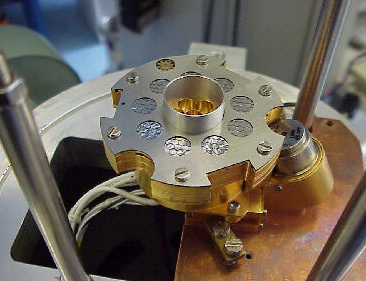 The APXS carries a small alpha particle source. The alphas are emitted and bounce back from a science target into a detector in the APXS, along with some X-rays that are excited from the target in the process. The energy distribution of the alphas and X-rays measured by the detectors is analyzed to determine elemental composition. The elemental composition of a rock describes the amounts of different chemical elements that have come together to form all of the minerals within the rock. Knowing the elemental composition of martian rocks provides scientists with information about the formation of the planet's crust, as well as any weathering that has taken place. As with the other instruments on the arm of the rover, the APXS sensor head is small enough to hold in your hand. Its electronics are housed in the warm electronics box (WEB) located in the body of the rover. Most APXS measurements are taken at night and require at least 10 hours of accumulation time, although just X-ray alone will only require a few hours.